In stage four from Loei to Phu Ruea, which featured the only climb in the Tour of Thailand, Zack Bell went up the road in a three-man break that eventually grew to seven. He picked up the intermediate sprint and a three second time bonus and the break reached the climb around 1 minute and 30 seconds ahead. This placed great pressure on the Seoul Cycling team with Bell already in the top ten on the GC. "Our team has ridden great all week, but today was exceptional," says Jonas Carney, performance director, leading the Thailand KBS squad. "We wanted Zack to get up the road, put pressure on the Seoul team and hopefully join the climbers when they caught him. He did an amazing job of making that happen and set our team up." 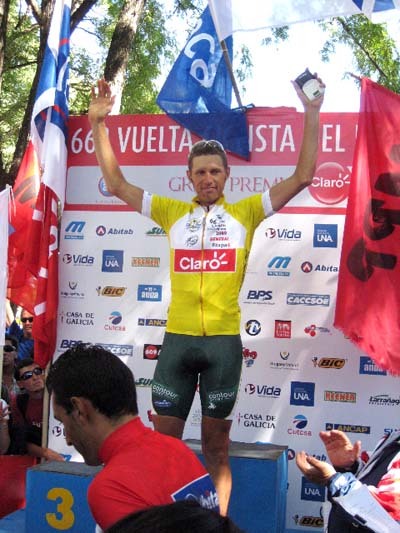 An Australian rider attacked from the break, going on to win the stage while Bell was caught by the leaders from the field close to the top of the climb where he joined teammates Jake Erker, Neil Shirley and Bowman in the front group of 15 riders. The group worked together for the final 18 km before Shirley escaped alone to finish second on the stage. "We work to make this kind of success happen," says Charles Aaron, Managing Director, Circuit Global Sport Management. "Ken, Jonas and all of the guys are doing what they do best and we're thrilled by both the results they're achieving as well as our ability to operate two international squads seamlessly at the same time." The KBS Thailand team now move into first place on the Team GC by placing more riders in the lead group than any other team and go into the Tour's longest stage of 180 km. 10 Gong Hyo Suk (Kor) Seoul Cycling Team all s.t. 2 Gong Hyo Suk (Kor) Seoul Cycling Team at s.t. 8 Hiratsuka Yoshimitsu (Jpn) Japan National Team both s.t.